Kevin Owen has worked in live television broadcast industry for the past 10 years, specializing in fiber optic systems integration and video engineering. Troubleshooting problems on the fly, often at remote locations away from the production truck has become an integral part of his job. Kevin is most often found working on entertainment shows such as The Emmys, American Music Awards and The Oscars but has also spent time in sports production at places such as the US Open, Nascar and the Super Bowl. 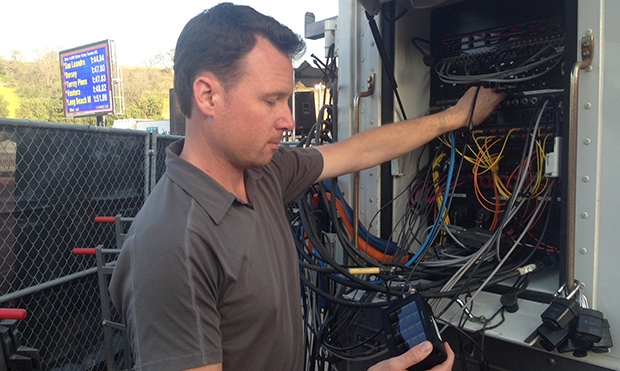 Portable test equipment in these environments greatly improves efficiency and response time, especially when there isnt any time to waste so Kevin took time out to put down his thoughts about Atomos solutions. I recently had the opportunity to try out the new Samurai Blade from Atomos and was quite impressed with all of the features that the design team managed to pack into such a small package. I stumbled onto the product almost by accident - I had just purchased one of their Connect signal converters (because it also doubles and a HD-SDI test generator) and was browsing the website to see what else they offered. The stunning display of the Samurai caught my eye at first, shortly followed by the fact that it could natively handle HD-SDI signals and was battery powered, what more could you want? I spend a lot of time working in the live television broadcast environment and am always looking for a good portable test monitor. It didnt take long for me to add this guy to my collection. The unit arrived in late December and three days later I was on a plane to New York to start setting up for New Years Eve in Times Square. It didnt take me long to appreciate all that the Blade has to offer. Startup time is fast at about 6 seconds and the 5 touchscreen is phenomenal with a native resolution of 1280x720. This is the first test monitor that looks every bit as good as the monitors back in the production truck if not better. I was on another show a few weeks after the Times Square gig and ended up sending a 16 window multiviewer output into the Blade. I was actually able to read the under monitor displays on each window! The other test monitors I have cant even come close to that level of resolution. Couple the high resolution with the focus-assist mode and you can now set up POV cameras accurately in the field. Moving on from the screen, this unit is packed with features. It includes a waveform monitor (with RGB parade), vectorscope, and embedded audio monitoring, all selectable as overlays on top of the picture or as full screen. Incidentally, having the embedded audio metering as a standard component of the default screen makes for very fast assessment of signal presence and channel assignment. This feature is fairly standard on the traditional rack-mount scopes and makes a great addition to a portable test set, no one else seems to be doing this as of yet. While the unit doesnt have a built in speaker, it does have a headphone jack for monitoring embedded audio and even lets you select which pairs of channels you monitor. Currently monitoring is only available for the first 12 channels of embedded audio, but I am told that the last 4 channels will be available in a future release. Battery life on this device is great, the design team engineered the Blade with power conservation in mind. There are two battery slots on the back of the unit for rechargeable batteries (or a power connector) so you can always have a spare battery with you. There is internal power monitoring of the battery level as well as seamless automatic or manual changeover from one pack to the other, a feature especially handy when using this device as a recorder. All of their units use the same battery, so if you have a Connect Converter/TSG, the batteries are interchangeable. Incidentally, the Connect converter will slide into the battery slot on the back of the Blade and actually power it for a short time with the small battery inside - thats how low the power consumption is! I mentioned that this unit also doubles as a recorder, all you need is a 2.5 drive. You can use a standard HDD, but a SSD will give you longer battery life. The record feature can be handy in a QC situation as it makes it very easy to snapshot a problem out in the field and then refer back to it later for analysis. If you record test signals onto the drive then the unit can double as a signal generator. Currently it isnt possible to output from the drive and simultaneously monitor an incoming signal, but I am told that the developers are looking into that functionality. If you prefer having a separate test generator, stick with one of their Connect units that easily docks on the back of the Blade for travel. All in all, I am quite impressed with the versatility and usefulness of the Blade in a field engineering environment. During an event recently I was helping another broadcaster troubleshoot one of their signals and I grabbed the Blade before leaving the truck. We followed his cable path and traced the problem down to the last barrel in the line. Relieved to find the problem, he thanked me and asked if he could keep the Blade. (I had to decline.) I have used the Blade on several shows over the past two months and it has all of the features that I look for in a test monitor. Add either a hard drive or a Connect Converter/TSG (or both) and you have a comprehensive field test set. The product can only get better with the design team at Atomos always looking for ways to make improvements to an already solid platform.